Since I submitted this complaint, Empire has agreed to remediate the situation. The whole experience was a headache that we wish we didn\'t have to go through. At least they are taking responsibility for it though. Empire Today Customer Service is awful. We ordered and thought it would be a pleasant experience. We were completely wrong. We did wood floors and a two day project turned into four. The job could have been finished in a day and a half. The first day the installer was there for a total of three hours because empire did not ship enough wood to complete a singe room. The second day the wrong material was ordered. Finally it was installed. We thought our carpet order was going to be ok but the same problem. Not enough material was ordered so the one day project turned into two. Since the project extended beyond the estimate my wife needed to call off work and we lost wages. Empire did offer compensation but no where near the amount of the lost wages. To make it worse, we were told in the estimate that if we received a lower quote it would be matched with no problems. 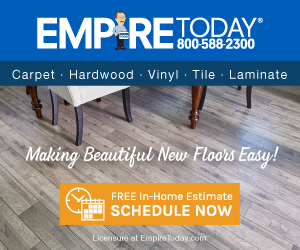 We received a lower quote and sent it to empire but then we were informed that there are several stipulations that must be met. Meanwhile we were told originally it would be matched no questions asked. Avoid a headache and avoid empire. Review #207492 is a subjective opinion of mmarkivich.